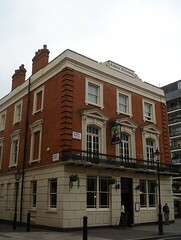 Samuel Smith's pub in Maida Vale. It was known as The Robert Browning until a change of name in 2013. The comments below pre-date that change, though it still appears to be under the same ownership. It has a Thai restaurant upstairs, called Ben's Thai. This is the same Ben's Thai that used to be in the Warrington around the corner. Square Meal says that you can have the beer in the restaurant, but we're not sure if you can have the restaurant food in the pub. As of November 2008 the opening hours for the restaurant were noon-2:45pm and 6pm-10pm Mon-Wed; noon-2:45pm and 6pm-10:30pm Thu-Fri; 12:30pm-3pm and 6pm-10:30pm Sat; and 12:30pm-3pm and 6pm-9:30pm Sun. Restaurant opening hours taken from blackboard outside, November 2008. Last edited 2016-01-18 19:13:02 (version 7; diff). List all versions. Page last edited 2016-01-18 19:13:02 (version 7).